Once a basic idea has been settled on, I then produce one or two sketches. Once you are happy with the composition I start the actual painting sending a photo of the finished work for approval. If there are any final changes to be made I will complete those, wait for approval and then send the painting off to my framer. I usually paint with acrylic paints on a stretched canvas. ​Please inquire about current waiting times. I am delighted to arrange this for you. I have an excellent framer and I can either suggest a suitable frame style or you can opt for a moulding of your own choice. I can also arrange an art courier or international shipping if required. The size of a commissioned painting is often around 75cm x 55cm but other sizes are possible. Commissions start at £2500 depending on the size and complexity of the painting. This price includes sketches plus any amendments required during the painting process. The price does not include framing. 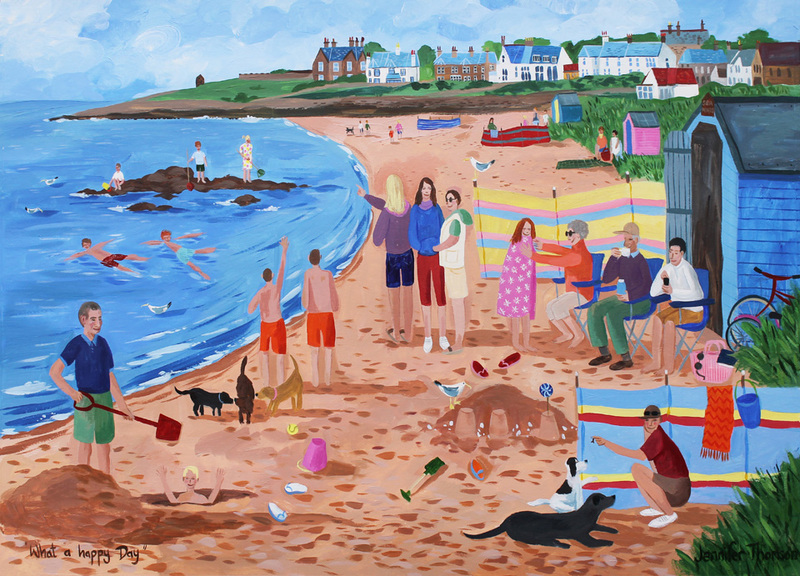 In the past some clients have asked me to produce prints, place mats or cards using the image from their commission. They make very personal gifts or keepsakes. I can provide quotes for this service. ​N.B. Copyright of a painting is owned by the artist. 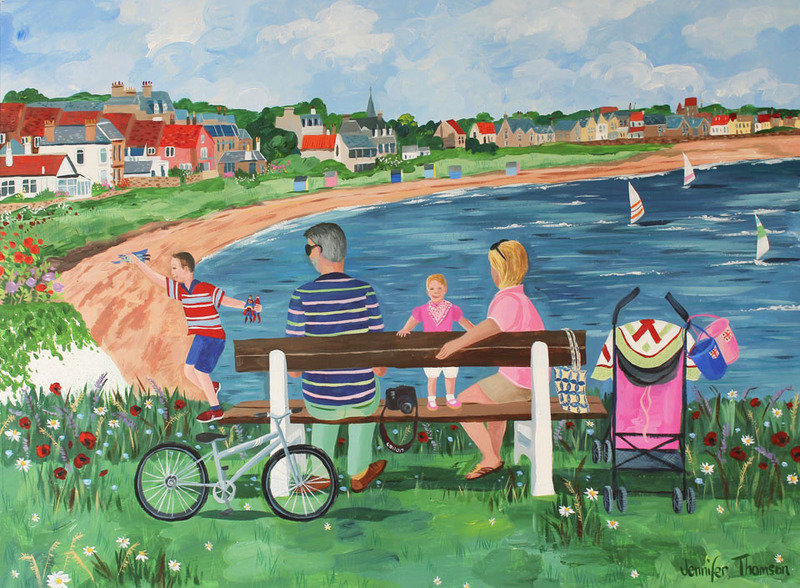 This scene shows an extended family enjoying their beach hut in Elie. In Grandpa's own words, the title is "What a Happy Day!". This painting was done for the couple driving their Austin Healey sports car. Other family members and their dogs are dotted around. 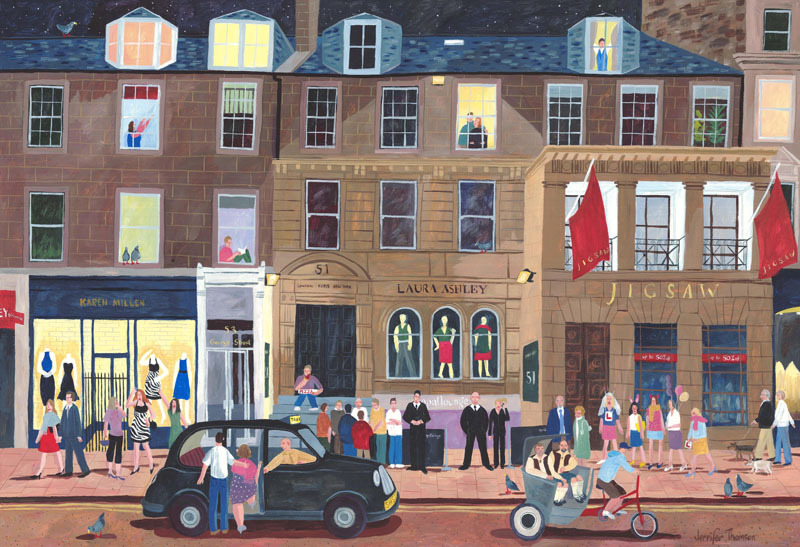 This Edinburgh night scene, commissioned as a wedding present includes both sets of parents and some of the couple's friends. 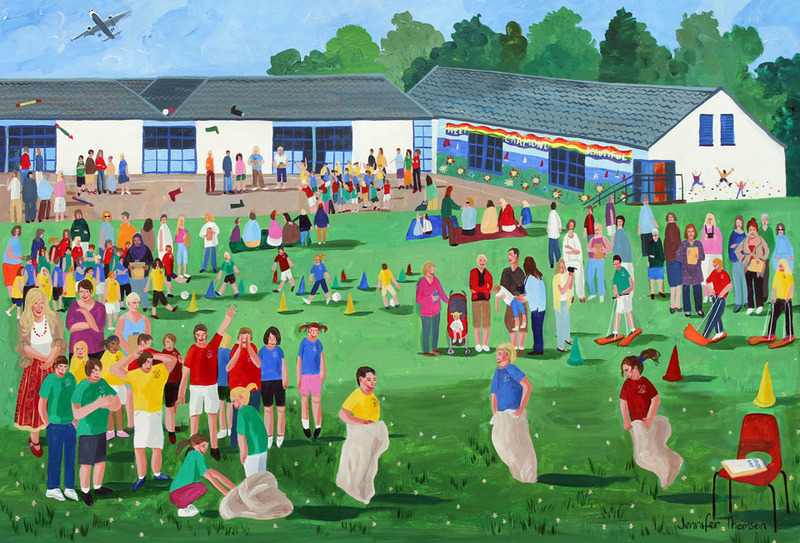 Commissioned as a leaving present for a Head Teacher, this was a joy to paint - so much energy and so many bright colours! This is one of a pair of commissions I did for Scotmid/Semichem. 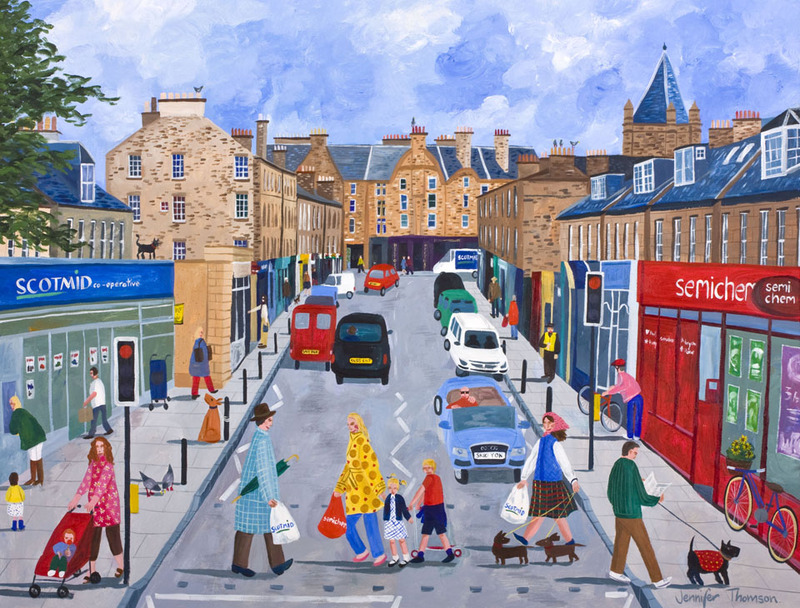 I had great fun including all the characters from another Stockbridge painting I had recently done. 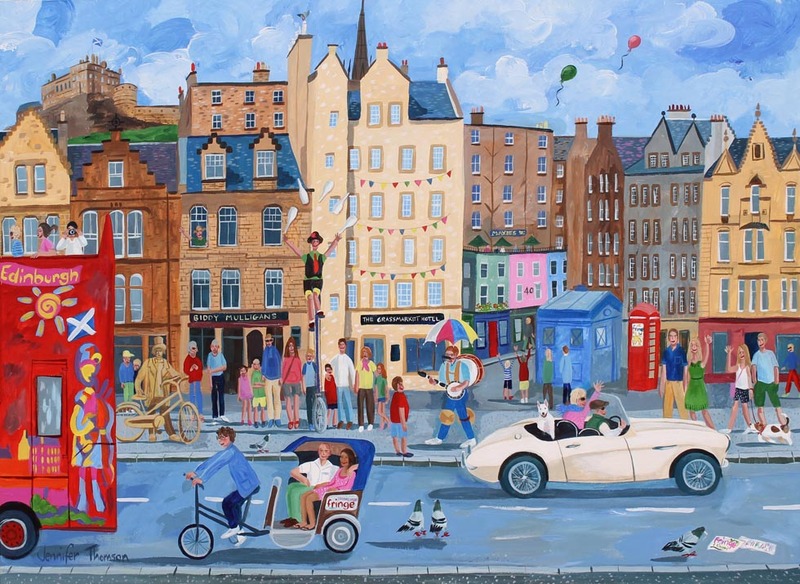 A gentle scene of Earlsferry incorporating many personal details and hopefully evoking the love, fun and excitement of being a grandparent.